I found this delightful recipe in Weight Watchers “Simply The Best” Cookbook. These meatballs are sooooo good, you would never guess they are so low in calories and fat! You can serve them as appetizers or enjoy them on a bed of rice for a satisfying meal! 1. Preheat the oven to 375 degrees F. Spray a non-stick jelly-roll pan with non-stick cooking spray. 2. In a medium bowl, lightly combine the turkey, pepper, scallions, bread crumbs, water chestnuts, egg white and soy sauce. Shape mixture into 32 equal meatballs, about 1-inch each; place on the pan. Bake until cooked through and browned, about 15 minutes. 3. Meanwhile, in a 2-quart microwaveable dish, combine the sweet and sour sauce and applesauce; microwave on High until hot and bubbly, about 2 minutes. 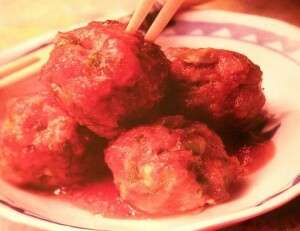 Gently stir in the meatballs and serve with toothpicks. Per Serving: 82 calories, 1 g Total fat, 0 g Saturated Fat, 22 mg Cholesterol, 163 mg Sodium, 9 g Total Carbohydrate, 1 g Dietary Fiber, 12 g Protein, 19 mg Calcium. Points per serving: 2. Makes 8 servings. I’m really intrigued (sp?) by this & I think I have all the ingredients. This may be tomorrow night’s dinner!